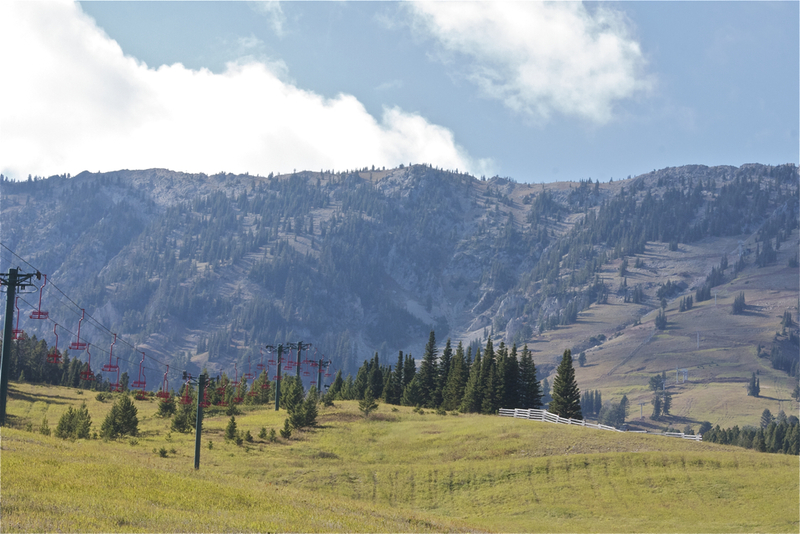 Nestled between the Bridger, Gallatin, and Madison mounain ranges, Bozeman conjures a sense of adventure yet is well balanced by a sense of community. We immediately felt welcome and at home and over the course of a few days were able to experience some of both the community and the outdoors. For us finding a food coop, a local brewery, and coffee roaster sum up some of the things we miss back in Norway. These aren't things that should be exclusive, but should bring all of closer to the source of quality, locally handcrafted and sourced goods at a reasonable price. Searching out the local artisan flavors on our travels, we have met brewers and bakers, roasters and growers. We have gained and even greater appreciation for eating and consuming local products. In Bozeman, a late morning stroll along a well worn path following a quiet creek brought us to the beginning of the "Main Street to the Mountains Trail". 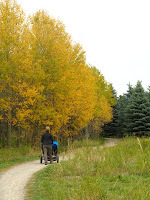 Cutting through golden aspen, birch and willow trees, past parks, and communal gardens, the path never strays more than a few meters from residential areas yet immerses us in a certain wildness. Birds sing, and we can imagine deer and other creatures wandering the same path in the early dawn hours. The community of Bozeman seems to nurture a greater respect for environment and puts forth more effort to maintaining the green open spaces that are vital to our everyday well being. The new community library serves as the starting point for the trail leading off into the forest. Adorned by locally crafted sculptures and art, the building beckons all to come inside and explore, or sit on the garden in front for a quiet break from the bustle of the city streets. We spend some time in the children's section, reading books and playing before we continued our walk exploration of the city. Eventually, we make our way back to the trail that leads into the hills and mountains beyond that offer even more possibilities. 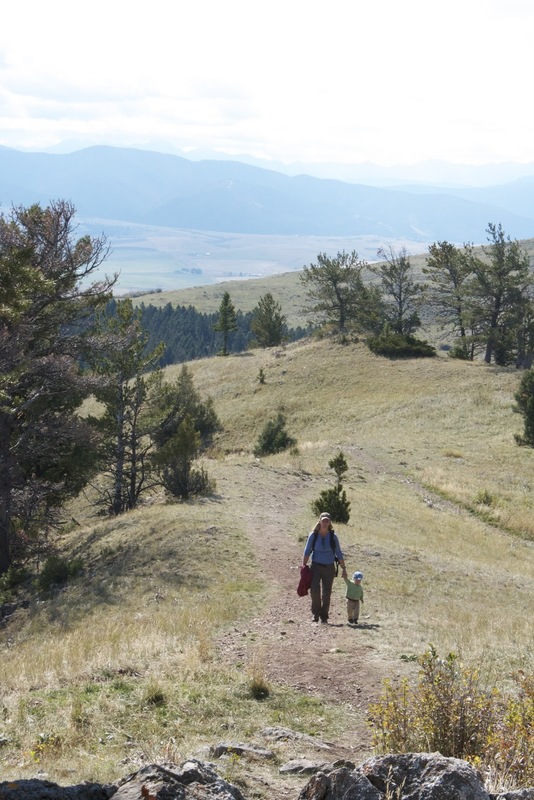 Our generous hosts led us on a hike up a bluff overlooking Bozeman and the Gallatin Valley. 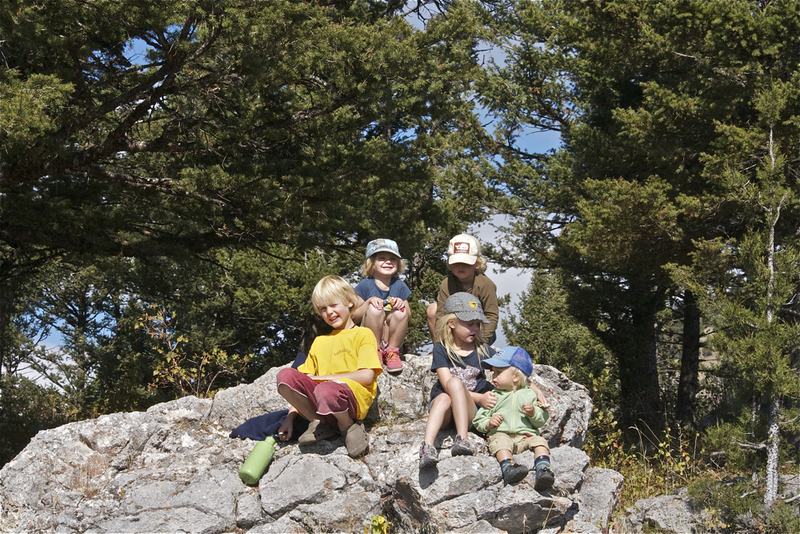 Our combined five children occupied alternately with their own adventures or exploring together. Venturing further into the Bridger Range we visited Bridger Bowl, winter home for the avid skiers of Bozeman. A number of families had made the short drive up into the mountains this beautiful autumn day for the annual raptor festival, in honor of the many eagles, hawks, and falcons passing over the upper ridges during their yearly migration before the first snow. While the birds headed south, the rest of us were thinking differently about the impending winter. Soon hiking shoes would be replaced by skis and the scene would take on a different, but equally vibrant atmosphere. The locals, like ourselves, appreciative of each season's unique chance to get outside and experience something different. It is this contrast of the seasons as well as the landscape that likely led most people to Bozeman and the sense of community that keep them here. Whether they be ice climbing in Hyalite Canyon, skiing at Big Sky, fly fishing the Madison River, Bozeman is home to many outdoor enthusiasts. We were grateful to be able to spend a few days at home with them.